A second investigation into work co-authored by Paul Morgan, a dean at Cardiff University, has cleared him of research misconduct, but has found that Rossen Donev, a former researcher at the university — who has already retracted one study — falsified images in four papers. As we reported last August, Cardiff “initiated its Procedure for Dealing with Allegations of Academic Misconduct in Research” after Science-Fraud.org and pseudonymous whistleblower Clare Francis brought concerns about several studies to the university’s attention. That followed an earlier investigation into work by some of the same authors. Cardiff has now completed its report, whose findings were first reported by the BBC and Times Higher Education. The Panel recommends that Cardiff University establishes and promotes standards for the publication of images of gels and blots. Alongside this, training of staff on these standards should be provided. of the more serious charge of fabrication. This is because it did not find any reason to doubt the validity of the articles’ underlying science. …says Professor Morgan should have “taken more resolute steps” to ensure Dr Donev left his source material with the department “for safe-keeping, as is understood to be the normal practice” and should have checked the original image files before the papers were submitted to the journals. Professor Morgan told the panel he now does this routinely. In order to ensure the highest academic standards are maintained it is necessary and right that allegations of research misconduct are assessed and investigated thoroughly. The University has examined more than forty published articles in relation to my research group and no additional findings of academic misconduct were made. However it is a matter of deep regret that the actions of one individual has had such a profound effect on the academic reputations of my colleagues and myself. We’re not sure which four papers the report refers to. Science-Fraud.org and Francis had raised concerns about five papers, in Cancer Research, Pharmacogenomics, Arthritis & Rheumatism, Clinical & Experimental Immunology, and the Journal of Biological Chemistry. The original retraction was in the Journal of Immunology. Cardiff tells us that the editors of the journals that published the four papers were sent the final report earlier this week, so the decisions to retract will be up to them. “The Panel recommends that Cardiff University establishes and promotes standards for the publication of images of gels and blots. Alongside this, training of staff on these standards should be provided.” – should they not have used the subjunctive mood in the first sentence? I also wonder if the word “scapegoat” sounds better in BE or AE. It does not sound good in Welsh English, though. From the university press release. “The Panel also noted that no-one, including other co-authors, peer reviewers or journal editors, had spotted these discrepancies prior to publication” is a statement. It is a bit like when journals say that the reviewers and editors did not spot discrepancies. What is it trying to say? I think what they are saying is, none of the authors spotted the dodgy images and decided to let it slide. In addition to the 2010 J Immunol retraction, these are the 9 papers flagged on SF. It’s not immediately clear which of these constitute the 4 that are the focus of the Cardiff report. Dr Brookes, while I would hate to anticipate any further investigations by the retired judge, I have a feeling we will discover that not only did Donev take all the original blots of the papers of which he is first, middle or last author when he left – he also took the original blots of papers on which he was not even an author! I don’t suppose that the manipulations are actually a hanging offense (at least not those in the sole retracted paper), but it beggars belief that the first author in the retracted paper was not aware the disputed figure was not a composite – and most likely either made the composite himself or at the very least supplied the original blots from which the composite was made. I wonder if any falsified images wound up in any theses – and if they clearly stated they were the work of their supervisor? But it does point to the powerlessness of science to police and regulate itself. This seems like a good outcome for ethical science, with the appointment of a retired judge to chair the panel being a sensible precaution against internal peer bias. Unfortunately British standards are not always this high. I have whistle blowing experience of a biased chair being appointed to head a formal enquiry and the outcome being entirely different. – It was a whitewash. There is a mass of evidence to support my claims. If you are patient enough to wade through it, go to http://www.cheshire-innovation.com/sali/pedsali.htm for the full story. Fig. 1c the left CD59a band (N) looks like a (slightly enlarged) horizontal mirror image of the right CD59a band (7). Now the dark vertical streaks in the bands bands make sense. You can use them to confirm the horizontal mirror images. So it appears that Cardiff’s panel only investigated four of the papers, and in all four they found falsified images. Having confirmed these four, they should have continued the investigation to look at the other two papers, and also others by these authors, and not stopped until they were confident that all the other papers are legitimate. As fernando points out, it appears the Cardiff investigation was concluded too soon. I know some will tell me off for saying so, but tilting the screen backwards does make it easier to see. It is not as if they had many samples and were running out of lanes. I don’t see the one who was found guilty by the retired cicuit judge in Cardiff among the authors, but I think that the judge did not look at this paper. J Neurosci. 2007 Jul 18;27(29):7663-72. The membrane attack complex of the complement system is essential for rapid Wallerian degeneration. Ramaglia V, King RH, Nourallah M, Wolterman R, de Jonge R, Ramkema M, Vigar MA, van der Wetering S, Morgan BP, Troost D, Baas F.
Neurogenetics Laboratory, Academic Medical Center, University of Amsterdam, 1105 AZ Amsterdam, The Netherlands. C1q panels. In both panels I can see vertical changes in background between the lanes, which I take as splicing. I know that J Neurosci only made splicing unacceptable in December 2012, and that the editor-in-chief of the journal will rush to say that it is O.K., but even in 2007 it was not considered standard practice. I know that they are only small points, but they are step away from reality. I know it is only an opinion, but we have too much “cleverology” and not enough reality. 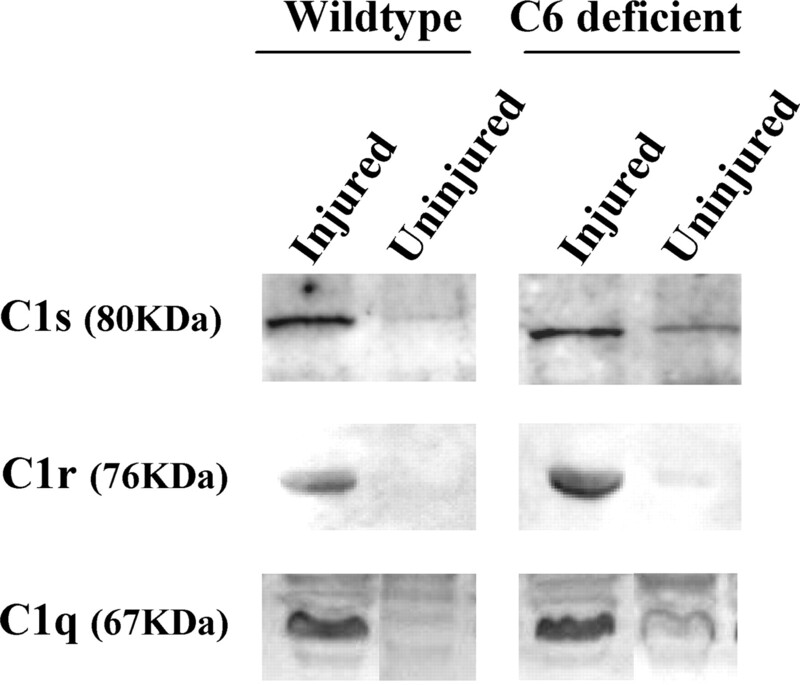 In the legend it says ” C1s, C1r, and C1q proteins in the injured nerves compared with the uninjured controls”. I suspect that is not completely correct. (I don’t know the correct answer, but the probability will be extremely small: Western Blots are routinely performed in the neurogenetics lab, why would anyone involve a professor at Cardiff, who likely hasn’t been doing any real practical work for ages, for that little thing?). For Kidney International (2001) 60, 900–909, though, where there are 6 authors, figure 4 is about BP Morgan’s speciality CD59, so the probability is higher. Well, the probability is higher that someone in his lab did something. Preparing a figure is not just the physical work in any case. Are you trying to say that BP Morgan is a manager? You mean at least two different people did somethings surely Marco? On multiple occasions too. If you read Paul Brookes comment above you will see. There may well be more to this than meets the eye. I know that this is old-fashioned, but to be on the publications an author is supposed to have done something. Preparing a figure is not just the physical work in any case. Authorship credit should be based on 1) substantial contributions to conception and design, acquisition of data, or analysis and interpretation of data; 2) drafting the article or revising it critically for important intellectual content; and 3) final approval of the version to be published. Authors should meet conditions 1, 2, and 3. Morgan could well have provided a substantial contribution to the analysis/interpretation of data. That does not require one to actually acquire the data or even prepare figures. He likely also did 2 and 3. My point was simply that he should have done something, including checking the figures forfinal approval. The reference was to show that there are certain things expected. We cannot judge all those things from this distance. Give me a dollar for every senior scientist who does not stare at a picture to look for potential splices, photoshop or other nefarious things, and I’d probably have millions. And that’s assuming there’s something to see here at all, which I doubt. Did you take a look? The BBC article is a light re-write of the university press release. More than 40, probably means less than 50 (otherwise 50 would have been stated), is a subset of 172. My point is that all the articles raised by sci fraud etc were probably investigated. We know that is probably not true. it seems that the university only formally investigated 4 papers. Michael Briggs mentions this above. What would be good if the universty made its report public so we could see which papers they had investigated and what they had found. Why don’t you just ask the University directly? I do wonder if Cardiff university investigated J Immunol. 2007 Feb 1;178(3):1783-90. This is in the public domain. I suspect that the university is watching. Why don’t you just ask the University directly? For exactly the same reason that I (and presumably you) use an avatar – there may be ‘consequences’. Ever since this subject was revealed last August, there has been a deathly silence on the issue in both School of Medicine and Cardiff University internal communications. The general feeling is that the elephant in the room is not to be openly discussed. As to public dissemination of the report, this may appear cynical, but I won’t be holding my breath. It may be worth taking a look at Neurosci Lett. 2013 Jan 15;533:96-9. In figure 1b I understand that the bands in the pS235 panel and Total tau panel should be superimposable so my point is not about them looking similar, although I do think there is something not quite right about figure 1b. In figure 1a I think that there are some more obvious things which look odd, and more subtle things. There is only one figure. I would like to make couple of more general comments, rather than focussing on particular publications. Are we to assume that publications from these laboratories are commonly based on single observations? If this is the case, how widespread is this practice, and what does it say about the quality of science in these and other laboratories? (2) Where does the buck stop? If Paul Morgan is ultimately responsible for the work coming out of his laboratory, shouldn’t he accept responsibility even if he was not personally involved in manipulating the images? This is a general response, not even just about the authors in this post, to the first question, which also leaves me puzzled. I can think of 3 possiblities. A. The true reusults/originals are kept in a special box, but we never get to see them, even though this is the evidence for the scientific claims at that time. B. Another possibility is summed up by the title of this song. C. All points between A and B.
I think that jhomtaz (April 20, 2013 at 10:33 am) made excellent points. A logical and reasonable avatar. I do want to mention a publication because of what I think is an evasive approach by Cardiff University. In Mol Immunol. 2008 Jan;45(2):534-42.
there are two people listed as corresponding authors. That of course might be a mistake. I know that it is churlish to point it out, but a cursory glance at the figures 1,2,3,4 and 5 might tell you that something is not quite right. – a cursory glance tells me there may be something not quite with the labeling of the photomicrographs in figure 6 too. Cancer Res. 2008 Jul 15;68(14):5979-87. doi: 10.1158/0008-5472.CAN-07-6828. 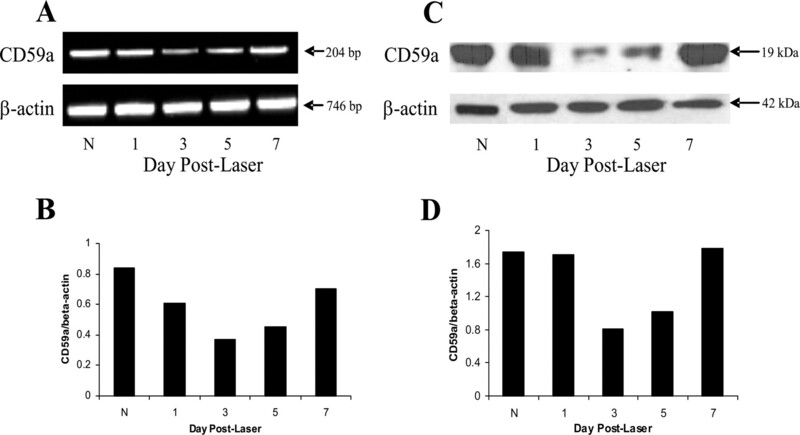 Modulation of CD59 expression by restrictive silencer factor-derived peptides in cancer immunotherapy for neuroblastoma. Donev RM, Gray LC, Sivasankar B, Hughes TR, van den Berg CW, Morgan BP. Department of Medical Biochemistry and Immunology, School of Medicine, Cardiff University, Cardiff, United Kingdom. Cancer Res. 2006 Feb 15;66(4):2451-8.
p53 regulates cellular resistance to complement lysis through enhanced expression of CD59. Donev RM, Cole DS, Sivasankar B, Hughes TR, Morgan BP.